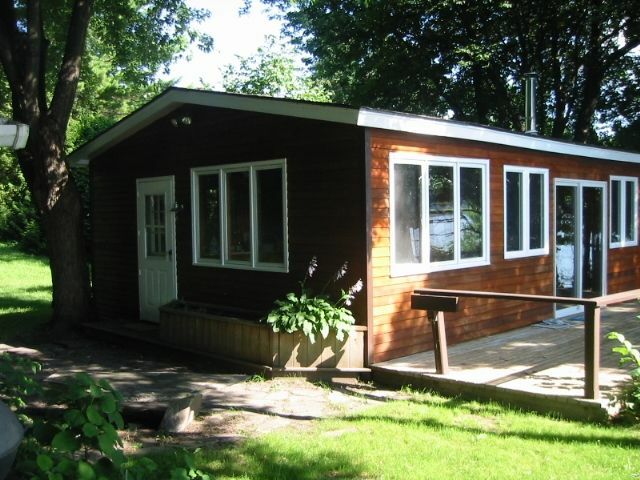 900 sq ft waterfront cottage, partial air conditioning, with 60 feet of beachfront in wooded area of Cedarvale Estates facing east on the Alburgh Passage. Large front room with fully equipped kitchen/dining area and living room with wood stove, water cooler, tv with dvd and vcr. Master bedroom, one bedroom with bunk beds and a twin, one single bedroom(sleeps 6). BBQ grill and large deck with lovely views of the Green Mountains. Dock available, canoe and kayaks on site. Excellent fishing, swimming, boating, Alburg Sand Dunes State Park with sandy beach a short distance away. Approximately 50 minutes to Burlington and 1.5 hours from Montreal. Pets welcome. Family Cottage Setting: The cottage is equipped for a relaxing family vacation. A 60 foot beach front is perfect for enjoying the lake and surroundings. Television, DVD player, VHS player, a number of board games and puzzles are available. Four bookshelves of books are available to enjoy. On the outside deck you will find a glass top table with four chairs and umbrella where you can enjoy playing games or have a pleasant meal or drinks. The shale beach is comfortable for sitting or lounging on and the dock is perfect for sunning. St. Anne's Shrine located nearby in Isle LaMotte: The famous outdoor St. Anne's Shrine is located nearby in Isle LaMotte. A peaceful place to enjoy the chapel and the famous statue of the Virgin Mary. Masses are held on Saturdays and Sundays. The Edmundite Fathers are the caregivers of the beautiful property resting on the shores of Lake Champlain. Well worth the trip. Restaurants: Hero's Welcome in North Hero, great sandwiches and Vermont products available. Shore Acres, a wonderful restaurant with a large dining room and excellent diner menu, facing east on Lake Champlain. North Hero House, a restaurant with a screened in porch dining area, great menu. The bathroom has been newly remodeled in 2010. A new vanity and shower and commode makes for a more spacious environment. In addition a laundry room has been added to make it convenient to wash your beach towels and linens during your stay and before you return home. A window air conditioner in front bed room will cool all sleeping areas if door to main part of house is closed at night. My wife and I enjoyed a marvelous week at Jeanette's cabin here, a week away just to ourselves. The house actually can accommodate more people, but it was perfect for us and our little dog to be able to tour the area, walk in the parks, and canoe on the lake. Jeanette and her property manager are so conscientious, keeping the place spotlessly clean, and checking in to make sure we had everything we needed. We cooked for ourselves in the open-floorplan kitchen all week. The view from the back deck is gorgeous and peaceful, and the dead end road down the Cedarvale peninsula has little traffic and no noise. This was exactly what we needed to get away and recharge. THANK YOU, Jeanette! We were lucky enough to meet the owners Jeanette and Ken with there great hospitality. Jeanette was great to deal with and answered our e-mails quick about any concerns. She made everything work out for a short notice holiday for 4 stressed out adults who really needed a quite vacation... that we really appreciate. We have some great memories now to look back at and laugh! In our crew we had 4 adults, two children and two small energetic dogs. The cottage is spacious, clean and good layout. The boat slip is great for families who decide to bring a motor boat for fishing like we did around the lake or boat over and spend the evenings at the Alburgh State Park beach which was my favorite hangout location. The beach is about a mile away by car and is perfect for children. The beach is clean sand and is gradual so kids can walk out almost 100 yards and be safe. The kids loved fishing for perch of the dock slip and caught easily over a hundred and don't worry we released them all back into the lake, except for the 3 big large mouth bass we caught they ended up for dinner one night. We must say a big thank you to Niel who is our "main man" who takes care of the property. Had to call him over a pump pressure issue and he was there next morning. Nice man to chat with and grew up in the area so he is a wealth of information. We were fortunate to have owners like "Jeanette and Ken" and a person like Niel for to take care of us. Good location and clean for a good price. Will be back for sure. It is always a pleasure to work with nice people like the Parkers and Daynekas. I am glad they made good use of the cabin and the lake Champlain area. I enjoy knowing my renters and aim to make their vacation as pleasant as possible. I would look forward to having them back again in the future. beach! We enjoyed kayaking, canoeing,swimming and all the many amenities in the area including bike rental! The customer service was great! We really enjoyed the privacy being off the beaten path feeling! and canoe with life jackets! We really appreciated that aspect!!!! We would definitely plan to come back in the future! South Hero.....went there twice because we enjoyed it soooo much!!! Also, enjoyed the local wine in South Hero at the Blue Paddle Bistro and the people there with their welcoming manner! As a location, the scenery was so soothing and the weather was unbeatable! Sleeping with the windows open was a dream come true!!! getaway and likes activity options that involve nature and fun!!! We fell in love with the islands and know you will too. Be willing to drive to attractions and restaurants.....a car is necessary. Love water sports, biking and hiking. Must appreciate rustic appeal and natural surroundings! The cabin itself was very comfortable and livable for our family! We did have beautiful weather the entire time.....cool at night! Hope you all do too! Thank you so much for such a positive review of our property, and the Champlain Islands, it was a pleasure to have you and your family there and hope you might come again in the future.